Johannesburg - Sports Minister Fikile Mbalula dismissed talk that silver Olympic medallist Caster Semenya held back on gold to avoid further controversy. 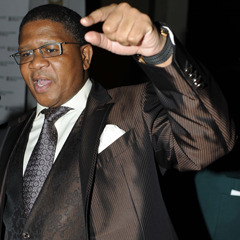 "This is a beerhall talk," said Mbalula on Monday. Semenya admitted to having left her "kick" too late to overtake Russia's Mariya Savinova in the 800m final at the Olympics in London on Saturday. "It doesn't work like that. I think Caster had her calculations wrong, but I don't think she should be castigated. It takes guts and courage to achieve those results." He continued: "When we talk about her, we must understand what it means to perform against all odds." Hers was a victory for human dignity. "If I was in her shoes, I don't think I would have been in a position to compete." In 2009, when Semenya was 18, her improved performance, and physique at the World Championships in Berlin were questioned. The university student was catapulted into a public controversy over her gender. Her athletics career was put on hold while the issue played out in the media. The matter also created massive upheaval at Athletics SA, with the entire board being suspended over the way the matter was handled. Leading figures in the ruling African National Congress, such as Winnie Madikizela-Mandela and expelled ANC Youth League leader Julius Malema, also leapt to Semenya's defence, saying she was treated abominably because of her race. By the end of 2011, Semenya had put the controversy behind her and was getting back in form, focusing on qualifying for the South African team for the London Olympics. Mbalula said her coach Mary Mutola and Team SA athletics manager Hezekiel Sepeng had done a "great job". "Silver is not easy. The same is for gold. The same is for bronze. It is sweat and blood." He leavened the atmosphere by adding: "I am an athlete myself, I know what it is like." Mbalula is known to participate in long distance cycling events, "without doping" he quipped.